Pixel Film Studios ProGlass Shatter allows Final Cut Pro X users to create unique shatter effects that can be applied to any photo or video. 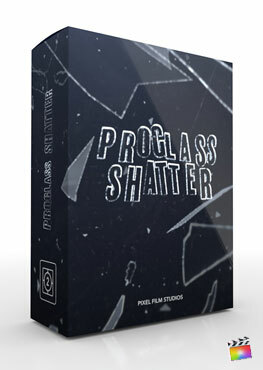 Give your footage a dynamic look with 1 of the 30 different shattered glass effects. Change the lightning to achieve a variety of reflections from the 4 different studio light options. Editors can move, pan, and rotate the camera in 3D space to achieve any desired look. ProGlass Shatter features easy to use controls to help FCPX users edit quickly and effectively. Shatter expectations and show off your next project with Pixel Film Studios ProGlass Shatter.